The Samsung Galaxy Grand Prime made its debut in the US back in April at Cricket. Now though it looks like another carrier is getting ready to sell it. We're talking about Sprint, which is apparently going to offer the Galaxy Grand Prime to its customers starting on July 10, which is this Friday. This information has been leaked through the image you see below, which is purported to be a shot of an internal Sprint system detailing the upcoming device. 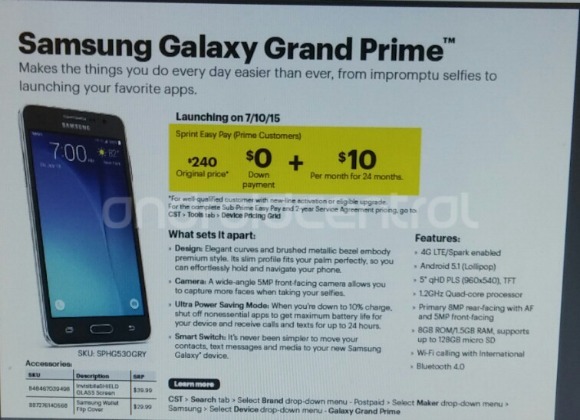 The same document helpfully lists pricing for the Galaxy Grand Prime too. If you want to pay full price for it, you'll need to shell out $240. Otherwise, you will be able to use Sprint's Easy Pay scheme to get it with $0 down, followed by 24 monthly payments of $10. The Galaxy Grand Prime will support Sprint's Spark high-speed 4G LTE network, and will run Android 5.1 Lollipop from day one. It's also going to have a 5-inch 540x960 touchscreen, a 1.2 GHz quad-core processor, an 8 MP rear camera, a 5 MP selfie snapper, 1.5GB of RAM, 8GB of expandable storage, Bluetooth 4.0, and Wi-Fi calling.